Cardi B: A Grammys Favorite, Okurrr! 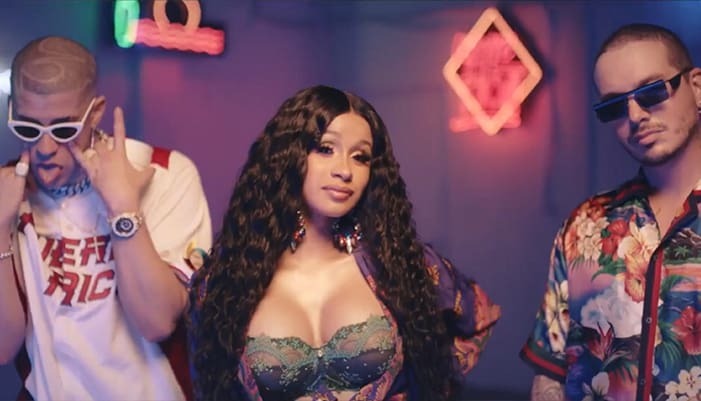 Dominican-Trinidadian-American, Cardi B is a favorite to win Record of the Year for her smash hit “I Like It,” one of five Grammy Awards nominations. She’s joined by Cuban-born Camila Cabello, nominated for Best Pop Vocal Album for “Camila” and Best Pop Solo Performance for “Havana” (Live). Regardless of an impressive list of Latinx nominees this year, led by Cardi B and Camila Cabello, music legend Gloria Estefan asserts, not enough is being done to recognize women artists, especially women of color. “You know, the Grammy voters, the vast majority are men, because women haven’t really been in the industry in the numbers that men have,” she said while promoting a new project at the Television Critics Association. Kelly Lawler, USA Today writes: Frustrations with getting artists of color recognized was part of the reason Estefan’s husband, producer Emilio Estefan, helped start the Latin Grammys, which were first awarded in 2000. The Latin music boom shows no signs of stopping. According to the Recording Industry Association of America: Latin music revenues in the U.S. grew 37% in 2017 to $243 million primarily due to music streaming. A major turning point was the 2017 worldwide-hit ‘Despacito’ from Puerto Rican musicians Luis Fonsi and Daddy Yankee, the most streamed song in music history. As non-Spanish speaking listeners become more familiar with Latin artists and more accustomed to hearing music in a different language, the demand for Latin artists’ tours continues to grow, according to Catherine Fournier, director of marketing at lyric licensing company, LyricFind, in an interview with IQ. Cardi B and Camila Cabello are among Spotify’s top 5 most streamed female artists of 2018. Cardi B was born Belcalis Marlenis Almánzar in The Bronx borough of New York City to a Dominican father and Trinidadian mother. The stage name “Cardi B” comes from a shortened version of Bacardi rum which people used to call her by. After gaining popularity for several videos going viral on social media, she joined the cast of the VH1 reality television series Love & Hip Hop: New York in 2015. She left the program two years later to pursue a career in music full time. Cardi B released “Bodak Yellow,” in 2017, earning her first two Grammy nominations. The 61st Annual Grammy Awards telecast is scheduled for this Sunday on CBS (8 p.m. EST/5 p.m. PST). John Leguizamo, ONE NIGHT Only!